The 2009 Isle of Man TT produced the fastest racing in the event’s illustrious history, with records tumbling as the world’s greatest road racers did battle around the legendary Mountain circuit. Now, fans can experience the incredible white knuckle ride as speeds hit more than 190mph just inches from houses, hedges and walls. Thanks to the very latest filmmaking technology deployed by North One Television, TT 2009 On Bike Laps Volumes 1, 2 and 3 put viewers in the hot seat for 12 complete on-board laps of the awesome 37.73-mile course. 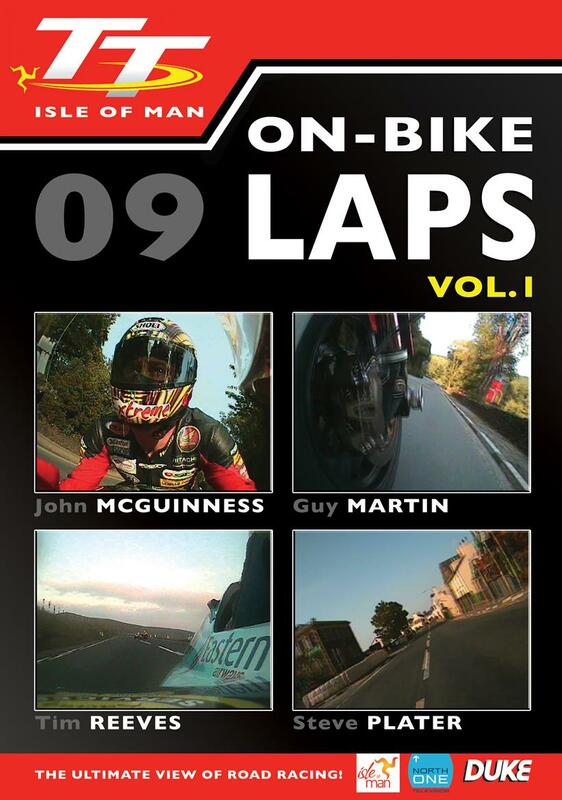 Volume 1 features laps from Practice Week with TT legend John McGuinness, two-times TT winner Steve Plater and the ever-dramatic Guy Martin, with AVERAGE lap speeds topping 128mph! Plus, we join three-times World Sidecar Championship team Tim Reeves and Patrick Farrance for a three wheel lap of the TT circuit. Exceptional footage is captured by a variety of camera positions – we look up into the visor of McGuinness, see straight ahead from Plater’s Honda and watch the suspension being battered on Martin’s Hydrex machine from the low-mounted camera. Volume 2 takes us into Race Week, with TT sidecar legend Dave Molyneux, 2009 double race winner Ian Hutchinson, Martin once again and Mountain course regular Carl Rennie. The action comes from the Superbike TT, as Martin laps at 127.685mph on his way to third, the first Supersport race, as Hutchinson romps to victory, the Superstock contest, where Rennie takes us around at more than 125mph on his 1000cc Suzuki, and the opening Sidecar race, where we join Moly on his way to a record-breaking 14th TT win. The footage is simply incredible – this DVD is worth watching to see the spectacular closing speed of Bruce Anstey from Hutchy’s rear-facing camera alone! 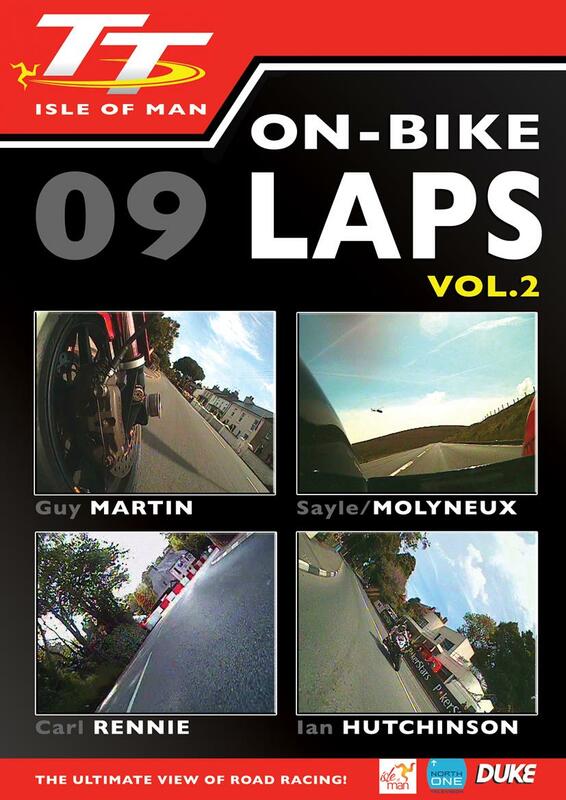 Plus, Volume 2 brings you a bit of history – the DVD debut of an on-board lap of the TT course filmed from an electric-powered bike. Viewers join Thomas Montano during practice for TTXGP, the inaugural race for clean emissions motorcycles, at an impressive average lap speed of 67.043mph. The forward-facing camera lets you share this historic lap - and the very first electric motorcycle spill at the TT! Volume 3 features one practice lap and two racing laps from the Mountain circuit, plus an entire TT race! First up is McGuinness again, this time on the Supersport bike in practice. The camera on the back of the machine shows the outright lap record holder jumping out of his seat on the bumps and lets fans see exactly how close the riders get to the scenery – you’d swear he’s scraping the hedges between Glen Helen and Cronk-Y-Voddy, and his bounce through Barregarrow will have you leaping out of your seat! Gary Johnson had the honour of leading away the Dainese Superbike race, and the footage captured by the rear-facing camera lets you see his Uel Duncan Honda bucking and sliding as he races into lap one. Just 10 seconds later, McGuinness was off and by Ballaugh he’s with Johnson – this jaw-dropping footage lets you share the pressure of having the TT’s fastest man bearing down on you. The ever determined Guy Martin is our guide to a lap of the Pokerstars Senior TT, the camera mounted low on the Hydrex Honda Superbike shows Martin’s incredible precision and the speed he catches, and passes, a rival. 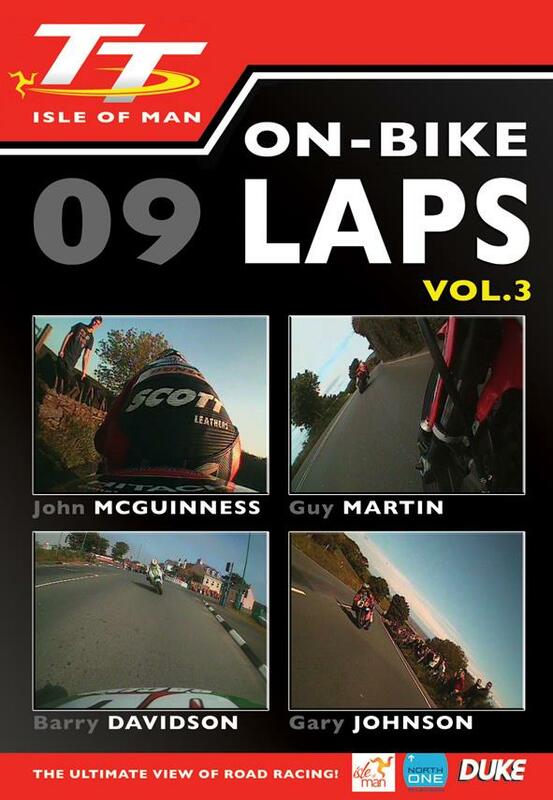 Finally, Volume 3 features a complete TT race from on board! The 4.25-mile Billown circuit hosted the Lightweight 250cc TT, and we experience all eight laps of one race courtesy of Barry Davidson. The rear-facing camera brings you the mass start and some truly nail-biting passes. TT 2009 On Bike Laps Vol. 1, Vol. 2, and Vol. 3 are OUT NOW on DVD, priced at £11.73 (each) and will be available from leading video outlets or direct from Duke Video: Tel 01624 640000, fax 01624 640 001 or email mail@dukevideo.com. Visit www.dukevideo.com online.